This is possibly the coolest hat in the world. You need it. If you want to stand out from the crowd, wear this hat. 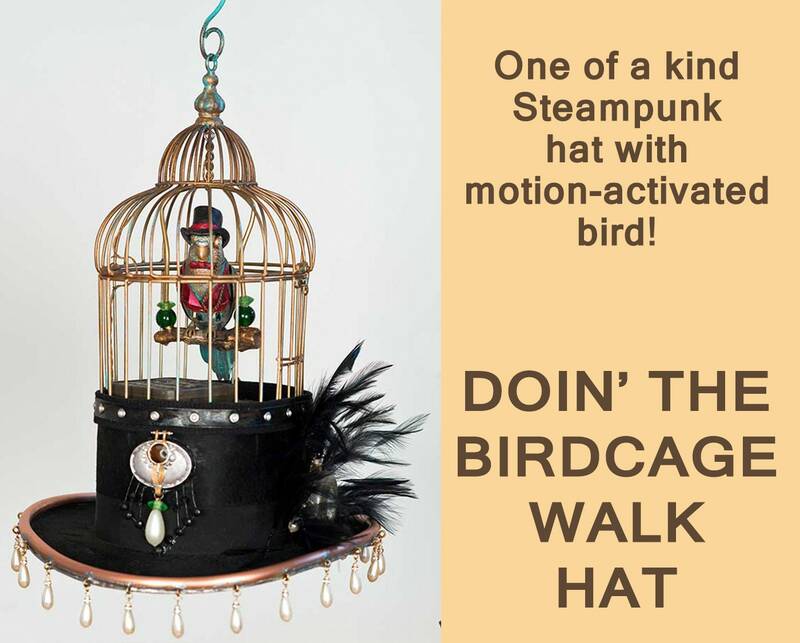 The bird is activated by a motion sensor and will chirp, sing and move (powered by 2 AA batteries). Stand is optional and NOT included in the price - shipping will be much higher with the stand. I spent far too much time making this hat, but it's truly one of a kind. INTERNATIONAL BUYERS: Please be aware that when items are shipped from the United States to a different country, you as the buyer may be subjected to additional tariffs, taxes or duties. This is something I cannot change and I cannot predict these potential costs. All customs forms I fill out will indicate the actual cost and description of the item. International shipping can take longer than expected due to items being held in customs in your country. comfortable with great design & story. Bought for a friend, they were very impressed, mentioned they may be a repeat customer! Very nice! Very interesting piece of art. I love the rustic look. If you're not happy with your order, I'll refund your money - it's that simple. I love what I do, and I am confident that you'll be happy with your purchase. If there is any problem with your order, please contact me and we'll get it sorted out. Most items made be 'custom made' or 'made to order' and will take longer (this will be mentioned in the item description). If an item is on hand, it will go out within 2 business days.